Get Free UMIDIGI New Launched Phone its UMIDIGI Power Smartphone. 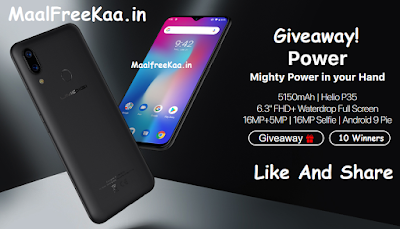 UMIDIGI Recently Launch new UMIDIGI Power smartphone you can enter Giveaway We're giving away 10 units Umidigi Power Smartphone Join our giveaway now and get your own for FREE! The more entries, the more chance to win! Total 10 winners! 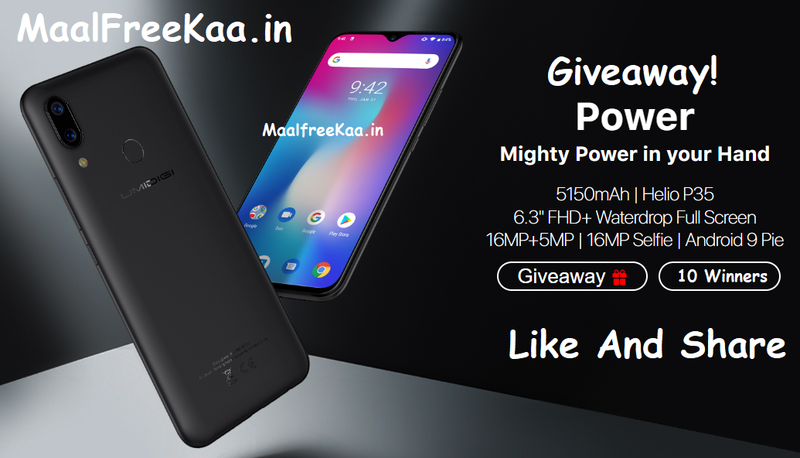 Complete the following steps to win a free UMIDIGI Power! Increase your chances to win by collecting more entries. The 12nm octa-core Helio P35 AI processor ensures a smooth operating experience with low power consumption and less heat emission Powered by the latest android version Android 9.0 UMIDIGI Power supports 33 global bands. Regardless of your place of residence or your destination for a journey, you can connect to the local mobile networks with your UMIDIGI Power anywhere in the world. Helping your phone deal with tasks smartly and swiftly. Giveaway for All (International Giveaway) Who's Participate?